The highly anticipated 1st royalty cheque finally arrives in the middle of June 2007. 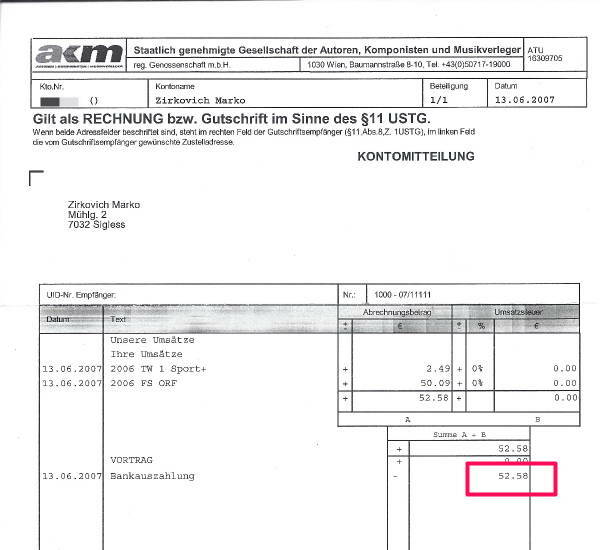 A whopping 52,58€ for the entire previous year. Of course we gulp and we are disappointed, but we are young, having fun, learning a lot with our feet in the TV door…. I think this sounds familiar, sorry for the déjà-vu. Over time I did earn significantly more money and even though I eventually stopped producing for the ORF, I still receive royalty cheques. Years later. That’s the power of licensing your tracks. 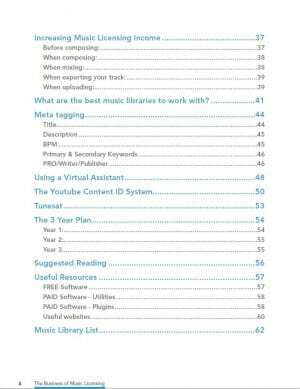 Lesson #1: when getting into writing music for any sort of library or publishing company, things need time. Don’t be impatient and don’t give up too quickly. 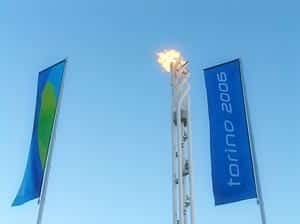 There’s quite a long pre-roll time involved before things get interesting and more lucrative. Is it really necessary to make all the costly mistakes yourself? Isn’t there a quicker way to have your tracks generating money for you? Without months or even years of trial and error? It seems to be part of a musical rite of passage to get scammed and exploited. How else do you account for the public image of the starving musician? When I told my mother I’d become a guitarist many moons ago, she envisioned me ending up busking in some underground station in Vienna. As a result of this “vision” she always put some coins in whenever she was in Vienna and walked by a street musician. After all, it could have been me. Bless my mum. 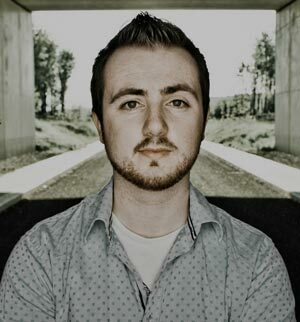 Now it’s time to introduce you to Emmett Cooke, a full-time composer for film, TV and video games from Ireland. I’ve seen Emmett enter music licensing platforms and become a top seller. I’ve heard him develop as a musician, composer, producer. I’ve observed him launch a couple of sites, be active on social media, increase his online presence – to the point where you ask yourself: does this guy ever sleep? And fortunately for us, Emmett wrote an e-book to share his music licensing knowledge and expertise. 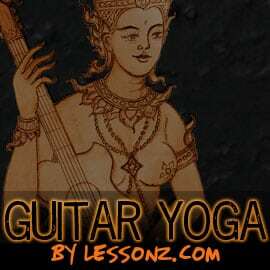 He is qualified to write about the topic, because it comes from real-life experience – no ivory tower music business theory about how things could or should be on paper, but rather practical stuff that any modern composer/producer is faced with daily. Lesson #2: learn as much as possible from someone, who is already where you want to be. Common sense, right? 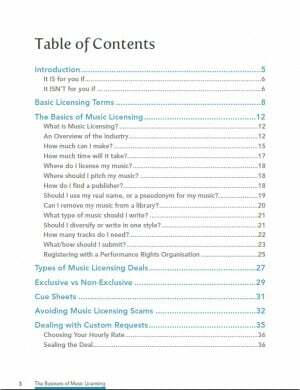 The Business of Music Licensing is a 73 page e-book. No fluff-pictures that take up space in order to mask and puff-up thin content, but no intimidating blocks of text either. Instead, it’s a well-formatted e-book that’s aesthetically pleasing and easy on the eyes. Emmett writes in a personal, friendly and engaging style. Unlike lots of other music business books he avoids legal jargon. First, he defines all the basic licensing terms in order to get you up to speed quickly. He even includes a great template letter for music library submission. I’d recommend that you probably should not use it verbatim, but rather modify it a bit to suit your own style and personality. Nevertheless, it’s great to have a template as a starting place. I definitely need to mention the 3-year plan. This is probably the highlight of the book. On 2 pages you have a music licensing business in a box. It’s simply brilliant. 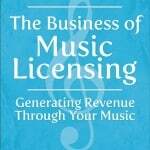 Personally, I’ve been so busy with teaching and creating video course material that I neglected music licensing. 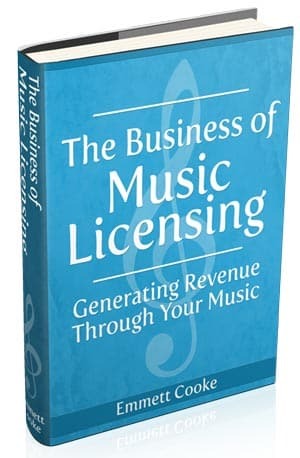 I have to confess that I let it slide somewhat, but reading this book (especially this concise 3-year plan) has given me an injection to re-consider and re-shuffle my priorities to start producing music for licensing purposes again. 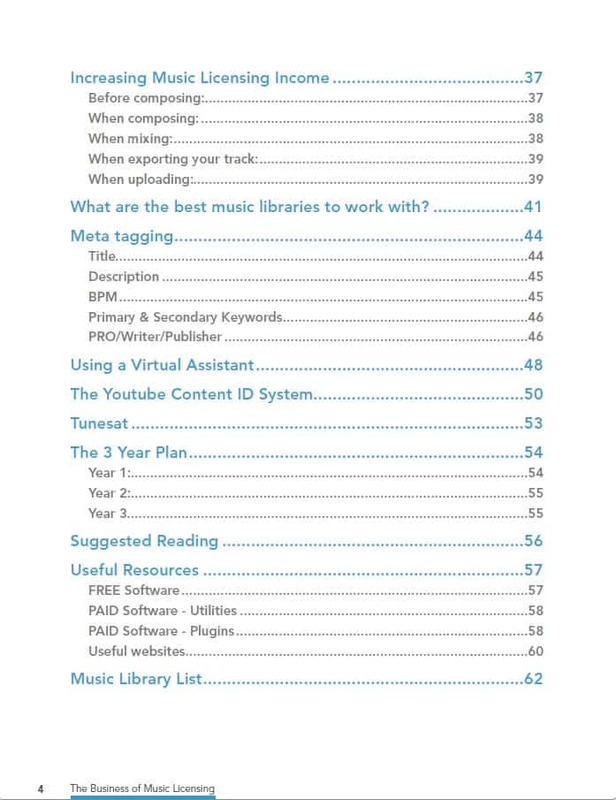 In the 2nd batch of music library resources, the websites are presented in a table format where you’ll have to go through the trouble of copy-pasting those addresses. In the 1st batch you simply could click on the link directly from the e-book. I came across 2 typos – at least that’s what I noticed. I didn’t actively look, so if you are OCD-inclined and carry a grammar/spelling-police membership card, you might find more. The Business of Music Licensing costs 12.99€, which is between 17 and 18 USD, depending on the exchange rate. That’s a deal. Actually, for all the real-life information and expertise that’s a heck of a deal. There’s enough actionable advice included, it doesn’t matter whether you are a bedroom producer newbie, or a busy musician trapped in non-residual activities – this book will get you going and then some. Beginners will appreciate the digestible definitions of terms and learning about the most common pitfalls to look out for and avoid. Like music licensing opportunities where you are required to pay to be played and other similar shady scams. Even long-time music licensing veterans will be able to learn something new, or at least it will make them re-consider their approach and organisation and therefore improve workflow and increase profitability. Ridiculously inexpensive for the amount of valuable information that you can act on. Make 1 or 2 extra sales at the cheapest stock music site and the book pays for itself. Wohoo, the first 5 star review on my site. Well, there aren’t that many reviews to begin with. I don’t want to just feature reviews and turn this into a review blog – there’s too many other interesting topics to write about. And the other products that I featured so far are highly rated too because I don’t want to present crap to begin with. What’s the point of that? A product has to be at least decent and useful to earn some pixels on this site. 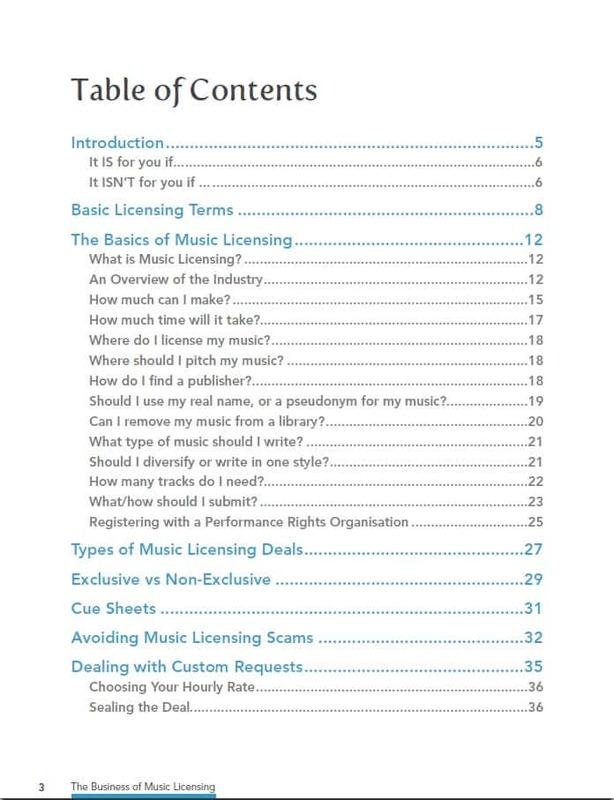 I urge you get the e-book and follow Emmett’s advice and with a bit of talent, lots of work, dedication and perseverance you too will be able to make music licensing work for you. This is a very endeering article! I don’t have much experiences with having troubles with royalties, but I do have a few experiences of being taken advantage of as a bright eyed young musician. I think you’re actually right. You can warn people about situations like this, but it only really hits home when you fall into one of those “traps”. I think that the majority of the music industry is filled with lovely people, and not too many people are “out to getcha”, however there are a few rotten apples in the bushel of music. Thanks for this wonderfully written article, and I look forward to reading more of your work! Thank you for the compliments about the article. I really appreciate it.